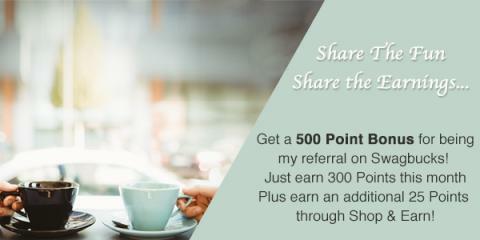 All throughout August you can earn large bonuses when you sign up as my referral on Swagbucks. 3. That's it. It's super easy, and Swagbucks is for real. I use it myself, and I've earned a total of 366,523 SB. I usually earn enough for $50-$75 in Amazon gift cards every month - even though I really don't have much time to give to it!